Exactly how did I ever fail to forsee when making it, that if I made my daughter a skirt then I’d be expected to make my son something?! Explaining that skirts are easy but boys clothes are harder did nothing to offset the perceived injustice. Neither did the bag of brand new shirts his uncle happened to send down. 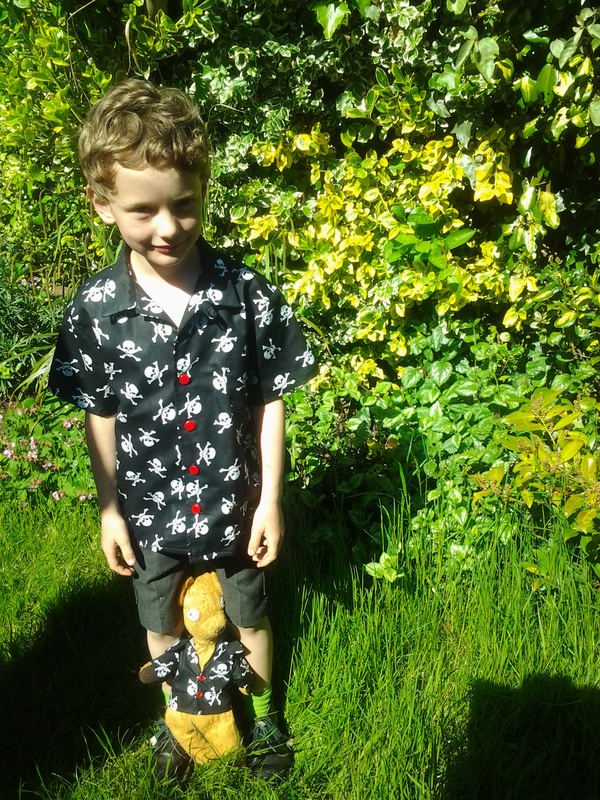 So, back in April, I took a big breath, bought a pattern (Simplicity 4760 http://www.simplicity.com/p-2184-boys-and-men-shirts-and-pants.aspx, shirt view B) and some fabric (hmm, not a lot of choice locally in shirtweight non floral fabric, skull and cross bones it is then) and pushed my comfort zone…. 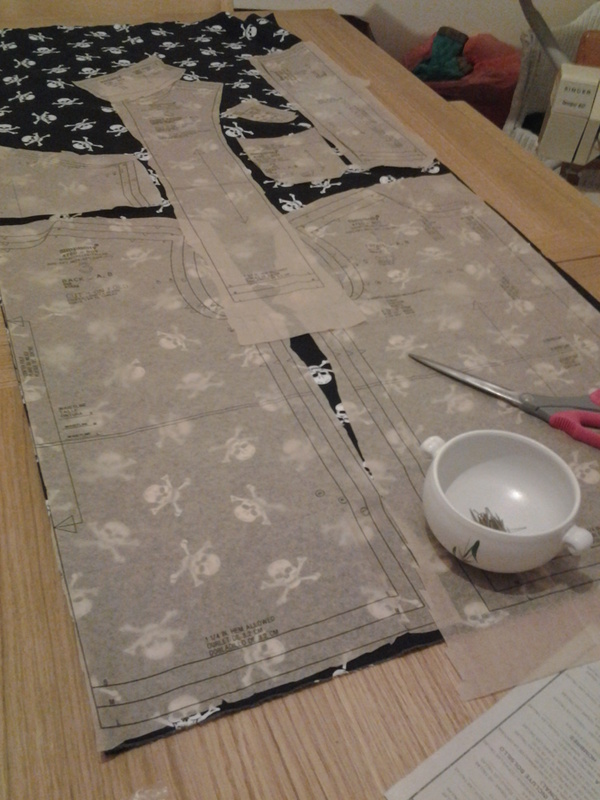 And soon I was in the strange world of pattern lay outs, marking notches and following patterns. It slowly came back to me from my GCSE days. Actually it wasn’t too bad, except that there were no instructions or suggestions for finishing off seams, not even a hint that now is the time to apply your chosen finishing technique. I guess I was lulled into a false sense of security by the instructions for the pocket (the first thing to sew), which were clear and resulted in a much better finished patch pocket than things I’ve bodged together in the past (I uses this technique on my shorts). 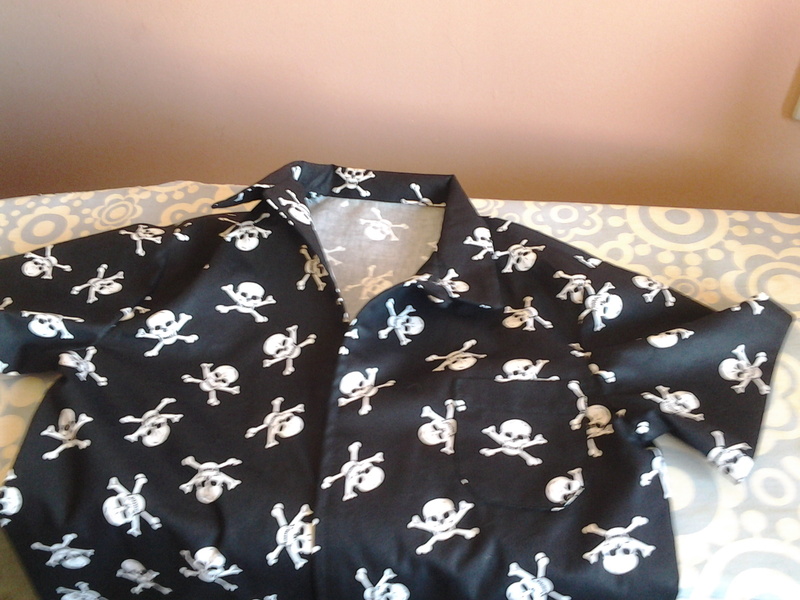 The boy was adamant he wanted just one pocket (less work for me) and I managed to nicely line up a skull and cross bones. I ended up just top stitching down the raw seam allowance in my shoulder seams in confusion when it dawned on me that finishing seams was up to me, but I managed to French seam the side and underarm seams. 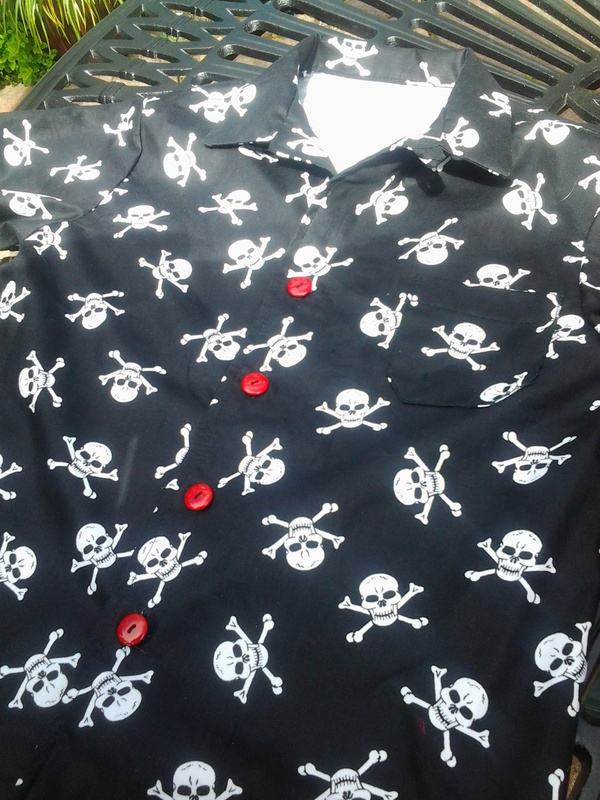 I decided to leave the yokes off the top front of the shirt, I cut them out but they just looked strange with this print, there wasn’t a way to line the skull and cross bones up so you could see what they were. Plus I didn’t really like them anyway and they didn’t seem essential to the garment structure. I took it with me to the shop and chose some lovely red lacquer buttons, really shiny, right up his street. I got one less than the envelope suggested because that’s what looked right. Then I lost the packet somewhere in the house and had to go and buy some more! Finally, the scary button hole making moment. Not too bad, I had to darn one straight away as I cut through the stitching when cutting the slit, but it’s been fine since. Then I threw a little something together with the offcuts, this time no button holes, the buttons are decorative, there’s poppers behind them. Can you spot the mini pocket? And when he got back from school that day to find I’d finished his shirt and made a surprise something extra, Growl got to try his on first. I’m pretty pleased with how it came out and it’s certainly been worn all summer. 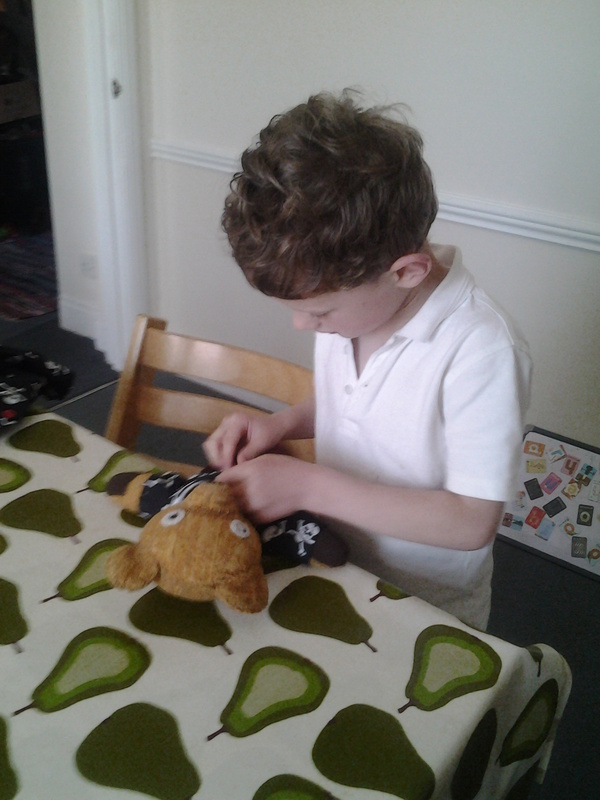 I’m glad that he pestered me to make him something as this gave me loads of confidence and was pretty straightforward to make (I deliberately chose short sleeves to make my life easier). The only thing I would change is to make it a little narrower and/or longer, the fit is pretty baggy. It’s true to the packet illustration, but my son is built like a bean pole! 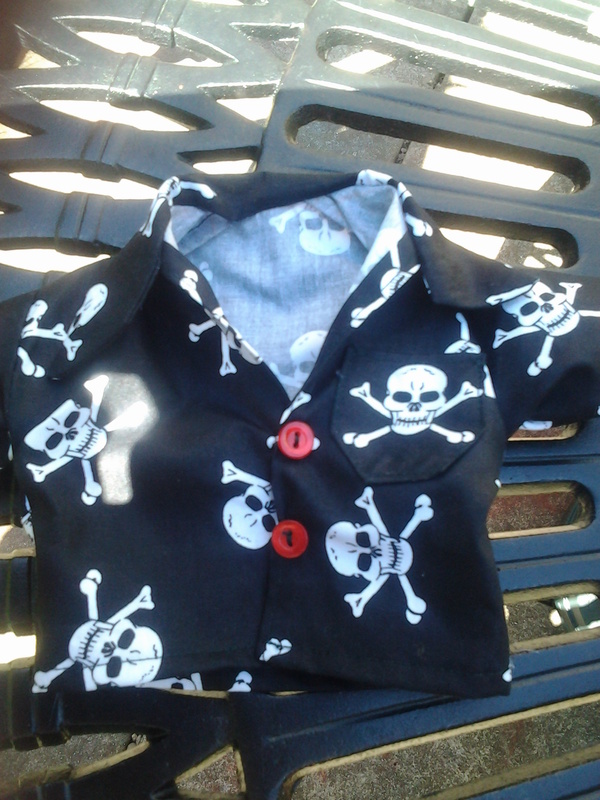 This entry was posted in Uncategorized and tagged 4760, boy, jealous, pattern, sew, shirt, simplicity. Bookmark the permalink.